Excellent news: SPANC is back. SPace Amazon Ninja Catgirls. It’s a game. @SJGames’ Ogre now on Steam Summer Sale. Ogre — Steve Jackson Games’ classic turn-based robotic tank wargame, now in digital form — is ten bucks off between now and July. I believe that the technical term for this is ‘ka-ching;’ I was waiting for this to go on Steam Summer Sale, and now it has. I look forward to blowing a lot of stuff up now. @SJGames’ Triplanetary available for (limited) pre-order. Steve Jackson Games Kickstarted Triplanetary, but I skipped that one because I didn’t have the money and I didn’t have the personal need to buy-in anyway. This is no knock on the game, which I understand is awesome; but I don’t have a history with it the way that I did Car Wars or (belatedly) Ogre. But if any of you do, hie ye hence to SJG and get the pre-order while you still can. In the Mail: Conspiracy Theory. I’m now wondering if my players will want to give it a whirl Saturday. The Ogre Miniatures Second Edition Kickstarter. Fine, let me go get my credit card. Geez, and I thought that I had published this one, too. I think I need to back to bed. — But, seriously, way cool. …at least, it looks like just GURPS 4e here on DriveThruRPG. Specifically, it looks like the GURPS 4e titles I’d put on if I was getting ready to offer them as a Bundle of Holding; at first glance, the only items missing from DriveThruRPG are the ones that involve licensed properties. Which probably means no In Nomine any time soon, dammit. Still: keep watching the skies. 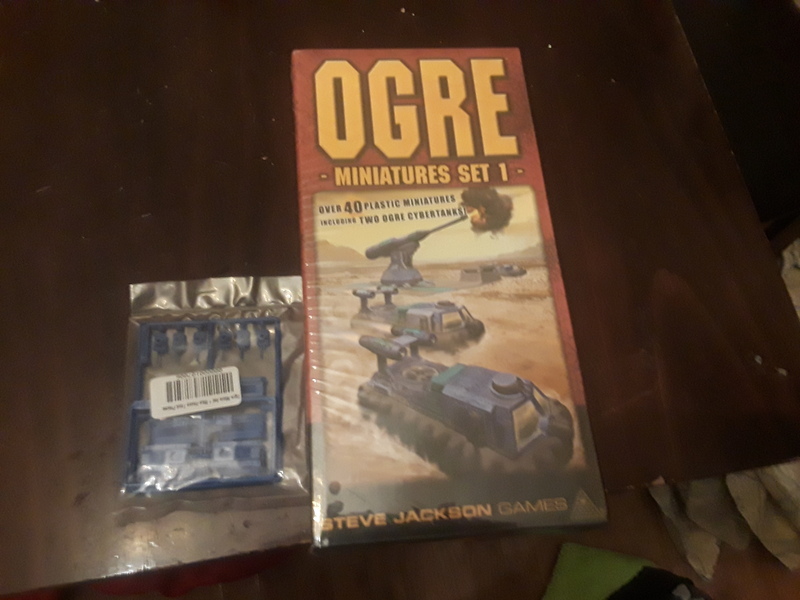 In the Mail: Ogre Miniatures Set 1. Shiny. Well, actually, no, they’re plastic. But: shiny anyway. You can still get Ogre Miniatures Set 1 from SJG, by the way. The basic set has everything that you need to play.